After her husband Captain Bob Hyde (Bruce Dern) is deployed to Vietnam, Sally Hyde (Jane Fonda) finds herself wanting to occupy her time by doing something meaningful. She begins volunteering at a veteran's hospital and runs into an old high school classmate named Luke Martin (Jon Voight), who seems to have a chip on his shoulder about the war, and rightfully so: he has been paralyzed from the waist down after taking a piece of shrapnel to the spine. Staunchly anti-war because of this, he becomes very outspoken against military recruiting, warning incoming soldiers of his experiences in Vietnam. Luke and Sally form a friendship and eventually fall in love with one another, though her husband is still actively serving in Vietnam. Topical for its day, this film deals with sensitive issues such as post traumatic stress disorder (PTSD), suicide among military vets, and the hardships of coming home. 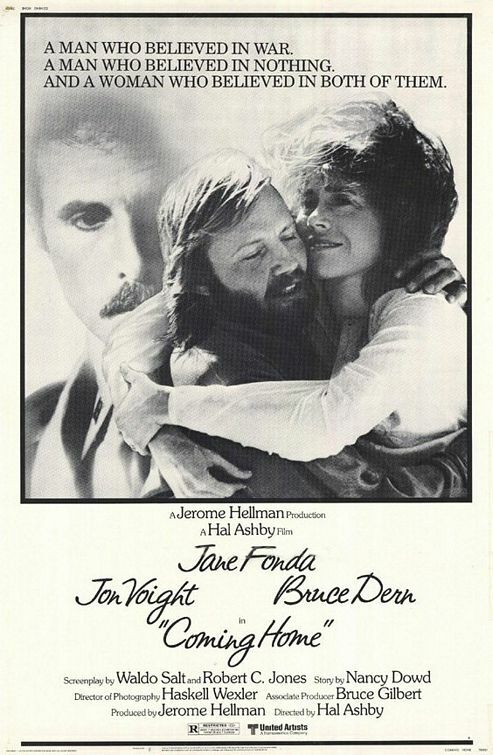 Jon Voight and Jane Fonda both garnered Academy Award nominations and ultimately won for their respective roles in this film. Even though BigJ and I didn't live through the Vietnam war, its effects are still felt today. Watching this movie in 2013 shows that it's still powerful enough to be impactful. Though the Vietnam war is in the past, there are still conflicts all around the world that people can relate to, and many people who now have family in the military can relate to the struggles of having someone come home from war. Jane Fonda and Jon Voight give brilliant performances in this movie. I like the way this film tackled the love making scene between these two characters though Voight's was paralyzed and in a wheelchair -- it was truly groundbreaking for its day, to delve into something that was considered "taboo."